Normally I consider myself pretty brave when it comes to food. I'll try almost anything. I've embarked on a mission to find the enjoyment in foods I couldn't stand; mayonnaise, horse-radish, tomatoes, blue cheese, raw onion, and I love them all now- next up I brave sardines. But when it comes to raw escarole I am a complete wimp, the stuff is just too... something; spicy, bitter, pungent? And this from the woman that likes straight vinegar. Lately my wonderful farm box has been coming with a huge bag of escarole, so I needed to find a way to eat it. It turns out escarole is fantastic if you cook the hell out of it. 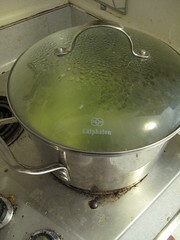 Heat the oil in a large heavy-bottomed stock pot and add the onions. Cook them over low-medium heat until they begin to caramelize. This might take up to 15 minute, but a good pot means you can pretty much wander around chasing shiny objects and neglecting the soup. 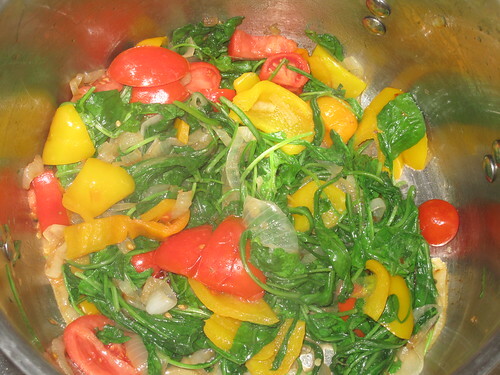 Add bell pepper and garlic, cooking until fragrant and slightly browned. 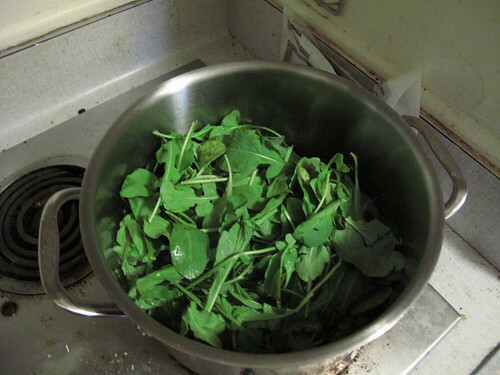 dump in the escarole, turning the pile frequently as it wilts. 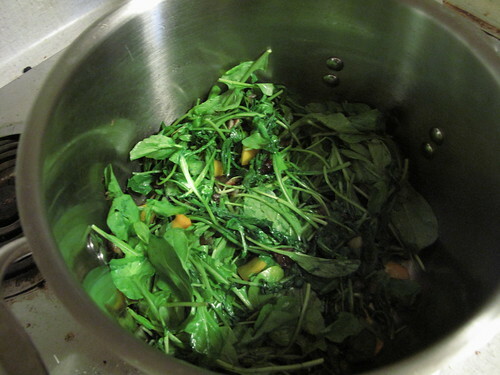 Once the escarole is fairly wilted (it will reduce by about %300) add the broth. Take your hand immersion blender and blend away. 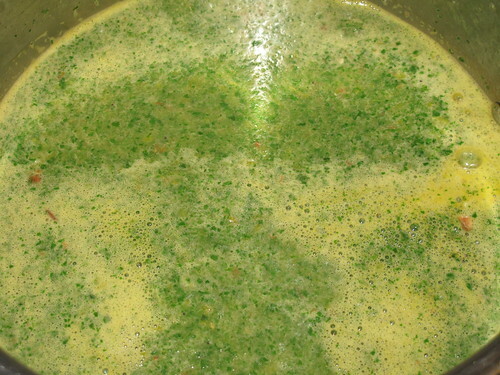 If you don't have an immersion blender, go through the process of blending the soup in small batches, careful not to let it get too hot and not to burn yourself. 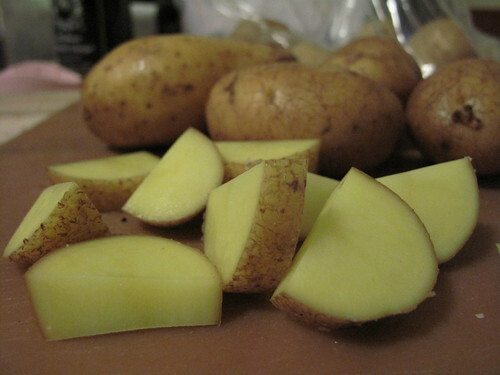 Add the potatoes and simmer soup until the potatoes are cooked. 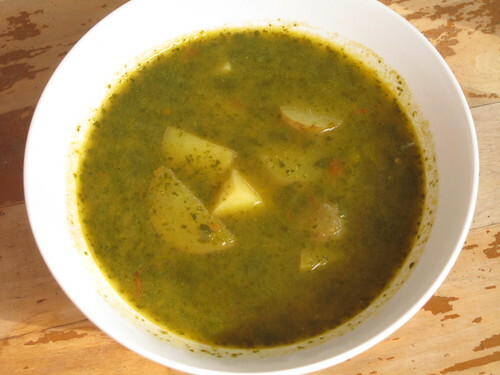 Or, if you're me, add potatoes then forget you were making soup. Wander into the kitchen every so often and wonder aloud what that tasty smell is. Realize over an hour later that you were still making soup. 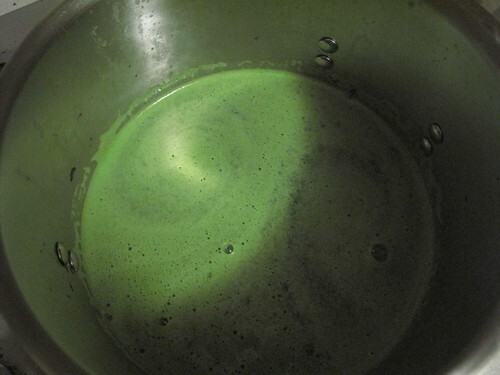 Lament it no longer has a beautiful emerald color, but rejoice it still tastes fine. Serve garnished with red pepper flakes, a pinch kosher salt, and a few drips red wine vinegar. This recipe made enough for 6 bowls of soup. I put half in the fridge to eat that week, and froze the other half for later. 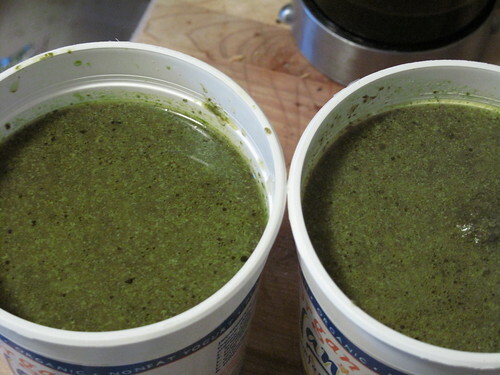 I used chicken broth, but I like recipes that can easily be made vegetarian or even vegan. Alternately, I made a second heartier anti-vegan batch later with these variations. Leave out the garlic, add some chopped tomatoes in with the escarole. Don't blend the soup quite as much, leaving it chunkier.